The BSE Sensex closed 190.29 points, or 0.54%, up at 35,150.01 and the Nifty 50 ended 60.70 points, or 0.58%, higher at 10,549.12. Outperforming the benchmark Sensex, the BSE mid- and small-cap indices gained 1.54%.All the sectoral indices on BSE, except oil and gas, posted gains, with consumer durables rising most at 2.6%. Healthcare, consumer discretionary goods, FMCG, IT and teck rose between 1% and 1.95%. Bharti Airtel said that General Tax Directorate of Niger has ordered the closure of the offices of Airtel Niger, seeking tax amounts that have been disputed by Airtel Niger. Bharti Airtel shares traded 1.1% down at Rs 291.05 per share. Where is the wrath of the markets? 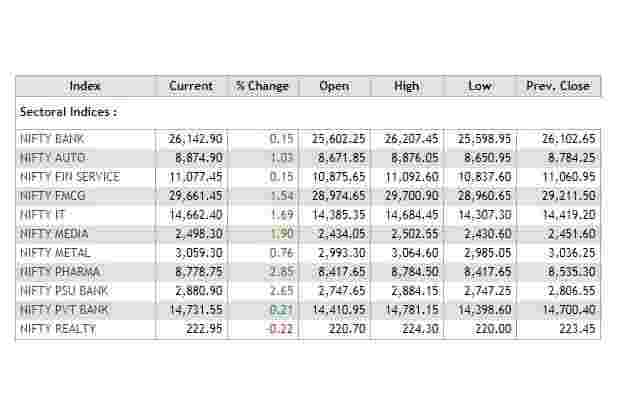 The BSE Sensex traded 148.46 points, or 0.42%, up at 35,108.18, and the Nifty 50 was up 68.85 points, or 0.66%, to 10,557.30. The BSE midcap and smallcap indices were up 1.35% and 1.02%, respectively. 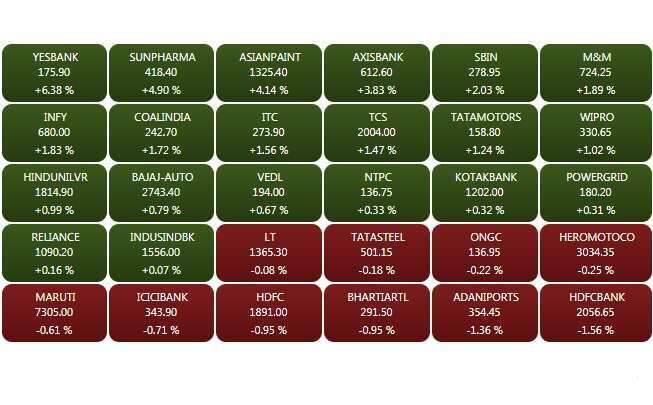 Sixteen out of 19 sectoral indices traded in green with FMCG, healthcare, consumer durables, IT and teck rising 1.5% to 1.9%. The government is likely to make an announcement regarding Urjit Patel’s successor as Reserve Bank of India’s Governor later in the day, Finance Secretary A N Jha said. 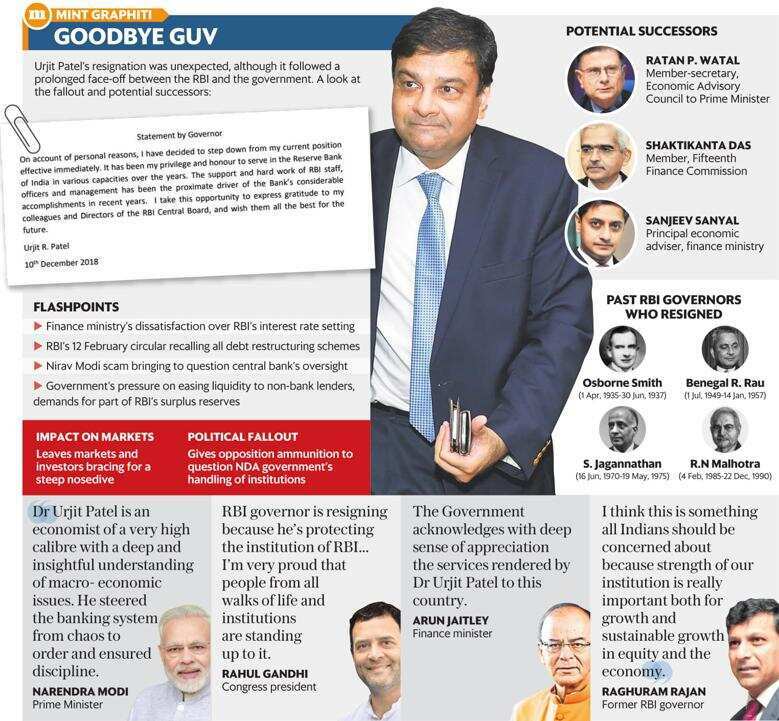 RBI has been rendered headless following Patel’s unexpected resignation, with immediate effect, on Monday. Speaking to reporters, Jha said, some communication from the government on RBI is expected. Kridhan Infra Ltd said that Ashok Goyal has resigned as CFO of the company, effective December 11. Shares traded 1.98% up at Rs 46.45 per share. The BSE Sensex traded 48.78 points, or 0.14%, down at 34,910.94, and the Nifty 50 was down 17.60 points, or 0.17%, to 10,470.85. 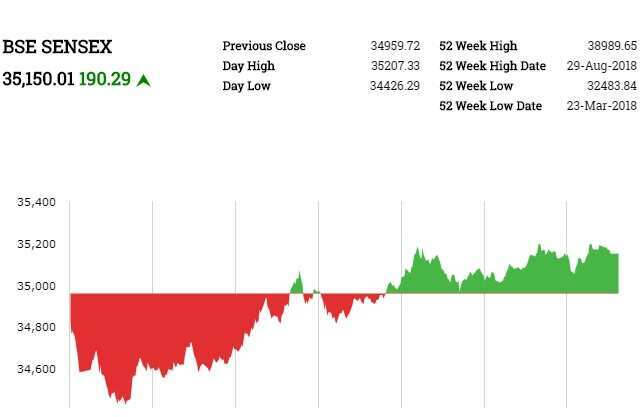 Intraday, the Sensex fell as much as 533.43 points to 34,426.29 and the Nifty 50 fell 154.6 points to 10,333.85.Outperforming the benchmark index, the BSE midcap and smallcap indices 0.95% and 0.49%, respectively. 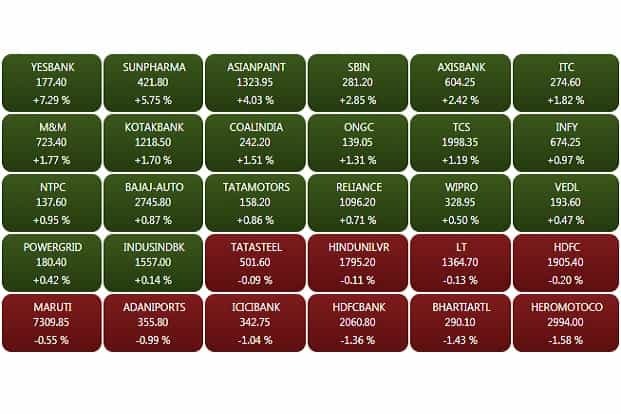 Among the sectoral indices on BSE, IT, healthcare, teck and FMCG advanced, while energy, oil and gas, utilities, telecom and finance declined. Dr Reddy’s Laboratories Ltd said that it has launched Omeprazole delayed-release tablets, 20 mg in the US market. Shares traded 0.76% up at Rs 2,710 per share. Strides Pharma Science Ltd said its Singapore JV, Strides Vivimed Pte. Ltd, has received approval for Albendazole tablets USP 200 mg from the USFDA. Albendazole tablets is a generic version of Albenza tablets® of Amneal Pharmaceuticals Inc. According to IQVIA MAT data, the US market for Albendazole Tablets USP 200 mg is approximately US$ 100 million. Strides Pharma shares rose as much as 1.7% to Rs 438 per share. 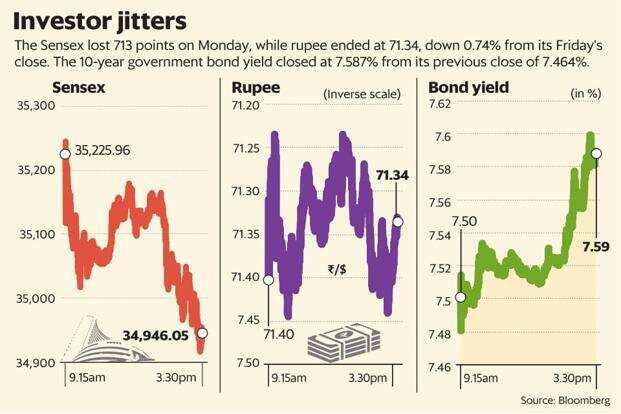 Shares of private banks traded lower after Reserve Bank of India’s governor Urjit Patel resigned on Monday. 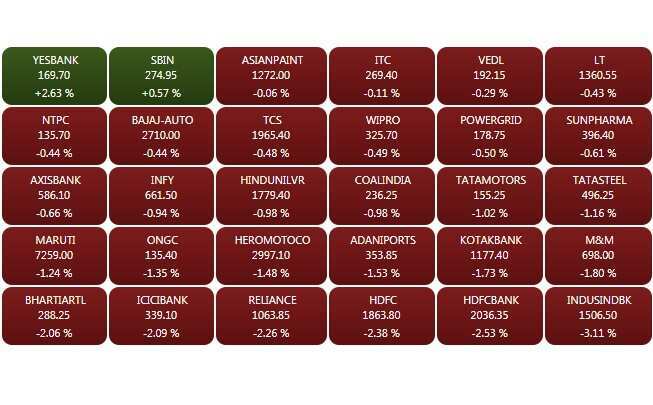 The Nifty Bank Index was down 1.65%, with HDFC Bank and ICICI Bank losing over 2%. Yes Bank shares traded 4.54% up at Rs 172.85 per share. Intraday, the stock rose as much as 4.9% to Rs 173.45 per share. The Yes Bank stock was the top gainer on the 30-shares Sensex. The BSE Sensex traded 452.35 points, or 1.29%, down at 34,507.37, and the Nifty 50 fell 137.65 points, or 1.31%, to 10,350.80. 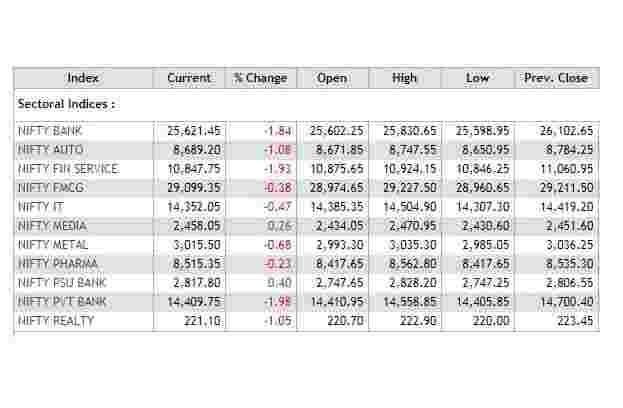 The BSE midcap and smallcap indices fell 0.6% and 0.73%, respectively. 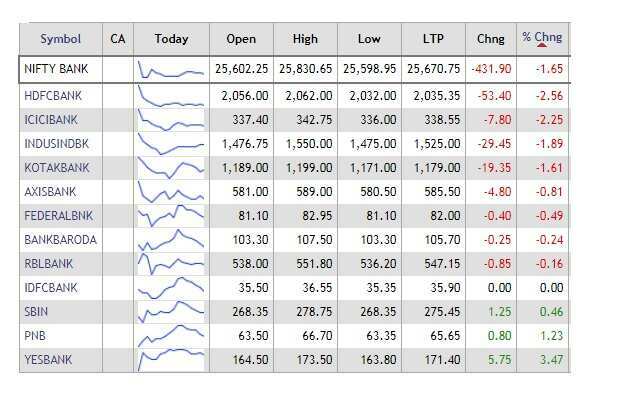 All the sectoral indices on BSE traded lower with energy, finance, telecom, auto, bankex and oil and gas losing over 1%. The BSE Sensex opened at 34,584.13, and hit a low of 34,458.56, down 501.16 points. The Nifty 50 opened at 10,350.05, and fell 153.35 points to a low of 10,335.10. #ElectionsWithHT | Counting of votes begins in five states. 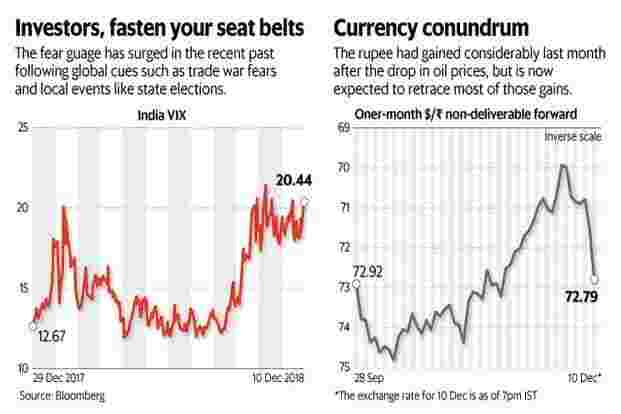 Exit RBI governor Urjit Patel, enter wrath of the markets? 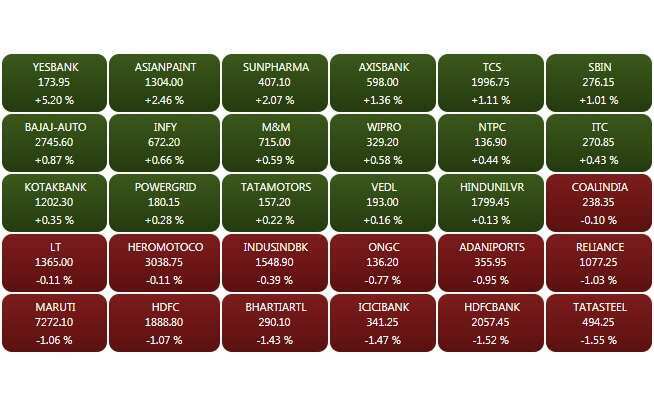 The Sensex closed at 34,959.72 points, down 713.53 points or 2%, while the Nifty closed at 10,488.45, down 205.25 points or 1.92%. 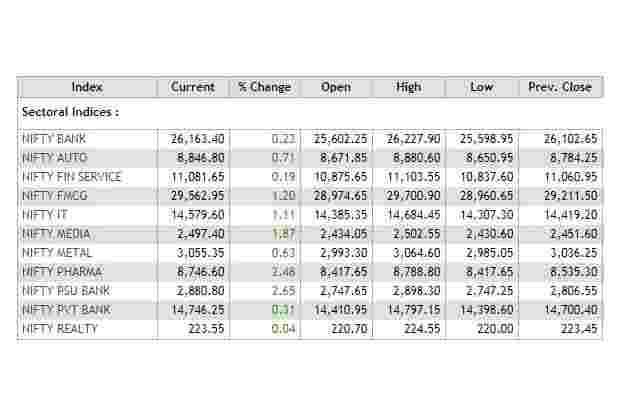 On Tuesday, the SGX Nifty futures 170 points lower.